If the drop down menu includes the optic you intend to use we have the programming done and do not need your optic. If you'd like us to cut your slide for an optic not shown in the dropdown menu please select customer supplied not on list and mail it to us. We will make every effort to program for your optic and cut your slide. 1 week turnaround would not be possible if we have to program for your optic. There is a $50 surcharge for the programming of the new optic. If customer is using their own red dot optic, screws must be sent in with the red dot so we can ensure the holes are tapped to the proper screw. Also include the battery if you'd like us to install the optic here. Price now includes drilling the rear sights on the combat cut version to allow adjustment of the red dot sight (when ordered at the same time). Position Notes: Combat is with standard rear dovetail. Combat with Leupold Rear utilizes Leupold's rear iron sight. Race has no backup sights. Race w/ front dovetail uses a standard dovetail in front of the optic. The FF3 uses a light sensor in the front of the optic. When melted, the auto sensitivity mode may not work well and if using a front dovetail mount, the sensor will be blocked completely. Gen4 Glock 9/40/357SIG OEM slides may not have enough room between the dovetail and breechface for a proper combat cut. When the slide arrives, we'll measure it and if it's too tight, you'll be able to either do a race mount, or front dovetail mount. The Venom uses the same footprint as the Burris FF3 so it works in all the same applications. Glock 9/40/357SIG OEM slides may not have enough room between the dovetail and breechface for a proper combat cut. When the slide arrives, we will measure it and if it's too tight, you'll be able to either do a race mount, or front dovetail mount. The depth of the cut may require a modification to the safety plunger. We will perform the modification here free of charge, but if the safety plunger is changed afterwards, the new one will require modification. The Viper has its adjustment locking screws located in the back of the housing. Price now includes drilling the rear sights on the combat cut version to allow adjustment of the red dot sight (when ordered at the same time). The Vortex Razor is too large to fit on 9/40/357 slides, however the 10/45 slides are wide enough to accept the Razor. 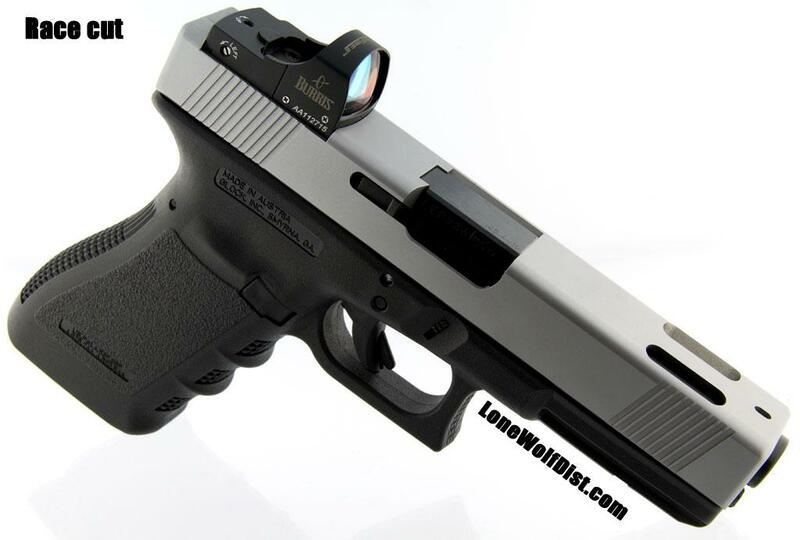 Most C-More sights can only be done as a race mount on 10mm or 45ACP slides. 9/40/357 slides are too narrow for most C-More's. The STS-2 is small enough to fit on both large and small frame pistols in combat or race mounting positions. 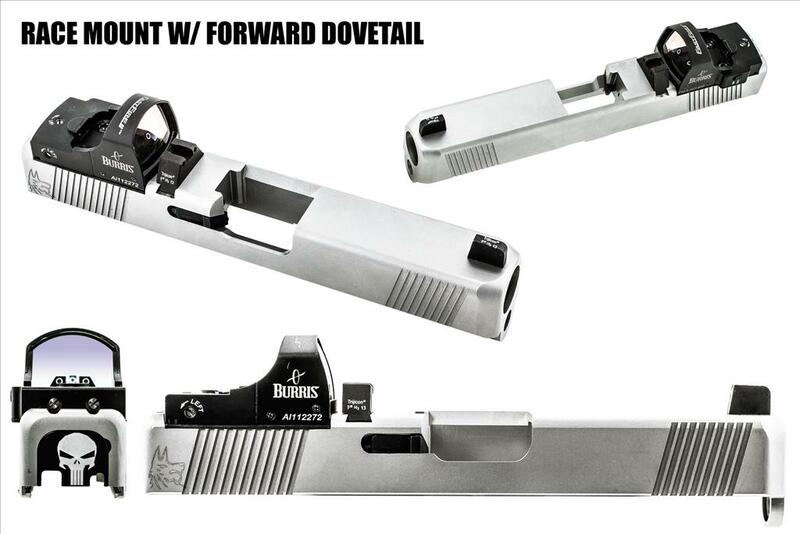 Gen5 slides will work with race or race with front dovetail positions only. The Shield RMS optic can only be done as a race mount on the S&W Shield slide, as the rear of the optic has rear irons built in. G42 slide is too narrow for the Shield RMS optic. All other slides - we suggest race mount only due to included rear irons. However, a combat cut is available if suppressor sights are used. Combat Cuts on Gen5 Slides - Due to position of the safety plunger, this cut is NOT available for Vortex Venom, Burris FastFire3 and Delta Point Pro sights. However, we can do a Race cut with forward dovetail. Machining for an optic on a Glock OEM slide results in exposed metal that is prone to rust. We offer a discounted rate for Cerakote when bundled with machining. You can also refinish it in Black Oxide which can be found on the refinishing page. We cannot drill adjustment screw holes in XS suppressor sights. 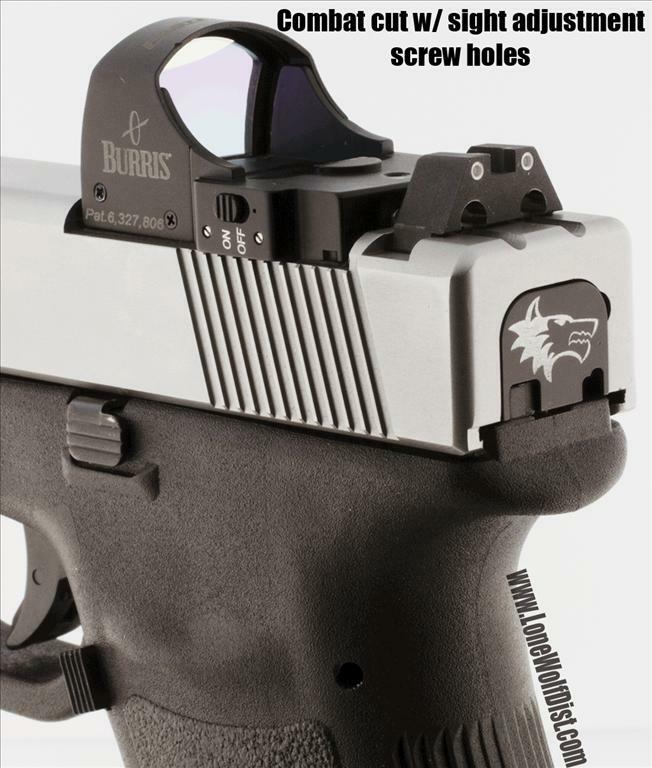 This affects Burris FF2, Leupold DeltaPoint PRO's, and any other optics that have screws in the rear body. These sights will not work with any standard combat cut mounting. They will work with race cuts with forward dovetails however. Looking for a more affordable alternative? Choose our "Drill and Tap" method.